Background: Parry-Romberg syndrome is a rare but well known type of facial atrophy. It presents well after birth in children, teens or young adults with the onset of progressive atrophy of facial tissues. While it theoretically can affect any part of the face, I have seen a disproportion of cases that involve the upper third of the face. (orbit, brow bone, forehead and skull) It is a very unusual condition that has no reason for its onset, gets progressively worse for years after onset and then stabilizes or ‘burns itself out’. It reportedly occurs more commonly in females and on the left side of the face…and my experience supports that occurrence. There is no known treatment for trying to stop the progression of the disease. I have used multiple sessions of fat grating and that seems to have a positive effect. But I can not say it will work in all cases. But at least there is no downside to fat injection treatments. For definitive reconstruction of the involved soft and hard tissue defects, it is prudent to await until the tissue atrophy has stabilized. Each case requires an individualized approach based on the extent of the soft tissue and bone defects. This cases illustrates one type of treatment approach. 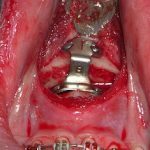 Case Study: This young female Parry-Romberg patient had involvement of the condition along the distribution of the left supraorbital nerve. It created a linear line of tissue atrophy way back into the scalp. This resulted in contour depressions of the brow bone, forehead and scalp. Most significantly there was a wide pathway of hair loss associated with the scalp tissue atrophy. Due to the scalp tightness and the width of the non-hair bearing scalp involvement, an initial procedure was done to place tissue expanders on each side of the normal scalp. Once they had been inflated over a course of six weeks after their placement, she was ready for stage two of her scalp reconstruction. 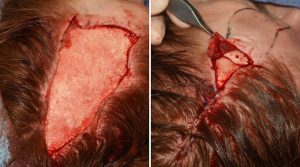 During the second procedure as much of the scar and non-hair bearing atrophic scalp tissue was removed. With the removal of the tissue expanders the sides of the normal scalp could be brought together for hair restoration of much of the scalp. 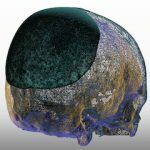 Prior to scalp flap advancements, the contour defect of the skull was reconstructed with hydroxyapatite cement. A 2mm thick layer of cadaveric dermis was placed on top of the bone down to the brow bone for partial contour restoration. Her result from this procedure provide some major improvement of her tissue atrophies . 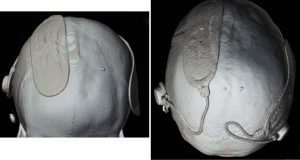 While she still may desire and require further reconstructive efforts her case illustrates the need for a variety of craniofacial reconstruction techniques in the challenges posed by Parry-Romberg syndrome. 1) Craniofacial linear scleroderma (Parry Romberg’s disease) is a rare tissue atrophy condition that often occurs along the pathway of the supraorbital nerve through the forehead and into the scalp. 2) For linear involvement into the scalp, hair reconstruction will require tissue expansion and scalp advancement flaps. 3) The skull bone reconstruction can be done by onlay hydroxyapatite cement. 4) Forehead and brow contour restoration can be done by a variety of methods.